Join State Senator Julie Morrison and State Representative Jonathan Carroll for a Legislative Update Town Hall. The event will take place on Thursday, March 29 at 9:30a.m. at the Alcott Center in Buffalo Grove (530 Bernard Drive, Buffalo Grove). 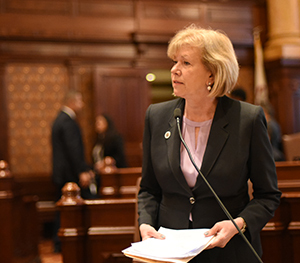 SPRINGFIELD - State Senator Julie Morrison (D-Deerfield) led the Senate this morning in passing several proposals aimed at preventing gun violence and mass shootings. Morrison’s first proposal would increase the waiting period to purchase an assault weapon in Illinois from 24 to 72 hours. Current Illinois law requires a 72-hour waiting period to obtain a handgun after purchase. Assault weapons, including the AR-15 and other military-style weapons, are only subject to a 24-hour waiting period. 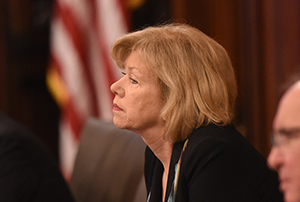 SPRINGFIELD – State Senator Julie Morrison (D-Deerfield), Chair of the Senate Human Services Committee, released the following statement today calling on DCFS to immediately release data on child abuse and neglect. The agency, that has released monthly child abuse data every month for 35 years, has not released any information since July of last year. 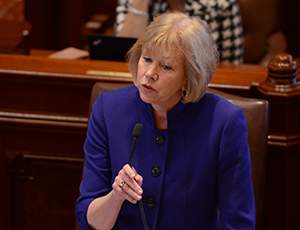 SPRINGFIELD – Family members concerned about dangerous behavior in a loved one with access to a firearm would be able to take action and potentially prevent tragedy under a measure passed today by the Senate and sponsored by State Senator Julie Morrison (D-Deerfield). Morrison’s proposal, called the Lethal Violence Order of Protection Act, empowers a close family member or law enforcement officer to alert the court system when an individual with access to a firearm is displaying threatening or unsafe behavior that could lead to injury to themselves or to the general public.